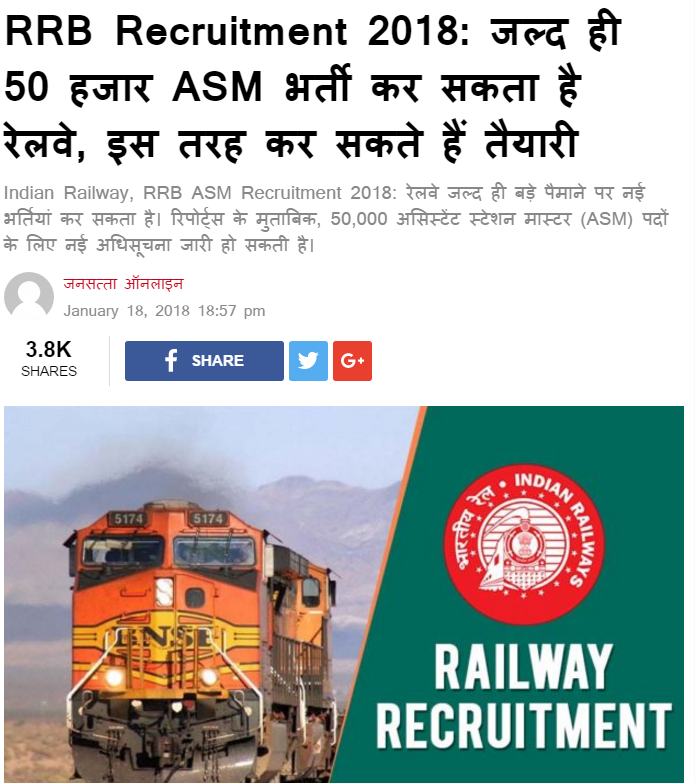 Railway, RRB ASM Recruitment 2018 - जल्द ही 50 हजार ASM भर्ती कर सकता है , Check below News Paper Inforamtion for Indian Railways ASM Post Vacancies. Railway, RRB ASM Recruitment 2018 - जल्द ही 50 हजार ASM भर्ती कर सकता है - Indian Railway Recruitment Board (RRB) is going Release online examination Notification to recruit 50,000 Vacancies for ASM POST to increase the strength of employee in Railway. The RRB ASM online examination will be conducted in two stage. For the first stage, RRB ASM will release notification in 2018 (Expected Soon as per Newspaper Jansatta). If you are waiting for Railways ASM RRB Recruitment for a long time then this opportunity is only for you in this year. Then Start your preparation early to crack the Railway RRB ASMJobs Recruitment 2018 examination. Here, we are going to share all the LAtest New/information related to the Railway Vacancy notification which is going to be released by the Indian Railway Recruitment Board Very soon as per News-sources. All The best for Upcoming Indian Railway ASM Recruitment .